The Econfina River (pronounced "eee-con-fee-nee" River) is located in Taylor County and is spotted by a friend of mine on a return trip from Tallahassee as a river that appeared to have paddleable water levels (most of Florida is, at this time, suffering from one of its worst droughts ever, which severely reduces paddling opportunities). 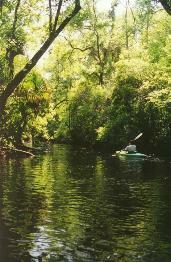 The River begins in the swamps of the San Pedro Bay at the Taylor/Madison County line and flows southwesterly through Taylor County until it enters into the Gulf of Mexico. The name Econfina is a Muskogean Indian word meaning "natural bridge." The River is fished for speckled trout, Spanish mackerel and mullet. Also found in the River are the uncommon Atlantic Sturgeon and the Suwannee Bass. We put in our kayaks very late-3:30 pm-and therefore only have time for a 3-hour paddle. 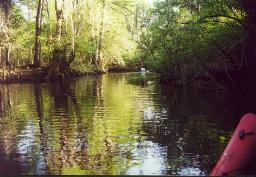 Nevertheless, the short section of the river we paddle is magnificent. 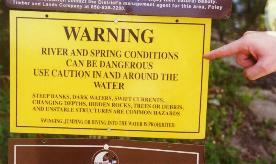 The water is tanic, tea-colored "blackwater," like the Suwannee. Several extremely large, old cypress trees and cypress knees line the banks. The banks are often show exposed limestone. We see no housing or other types of development until we reach the take-out point, because much of the land along the river is owned by paper companies. It is a quiet, tranquil experience. The river requires some degree of technical paddling skill since (see photo above), at least during higher water conditions (we paddled it in the midst of a long drought), sections of the river are swift, there are large trees that the paddler must either duck under (very limbo-like) or portage over, the river is fairly narrow, and there are almost continuous "S" turns as the river winds its way through the forest. Three of four times during our short paddle, we saw a large gator slip into the water in front of us.